We love finding Solexx Greenhouse projects on the internet. 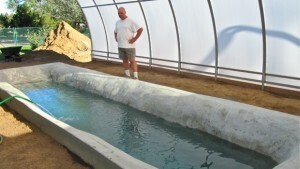 Here is a Solexx custom greenhouse used cover a tank of Tilapia fish. Wanted to share a recent review an Eastern Washington customer left on our website about there experience using Solexx Greenhouse Covering…. We had two greenhouses. One was a hoop house covered with greenhouse film. The other is 12 x 24 covered with the Solexx Panels. The hoop house was recently destroyed by snow and wind, the Solexx Greenhouse is still up and growing many of our winter greens. Having had both kinds of greenhouses, don’t waste your money on the thin ( 4 mil) filmed plastic greenhouses. They always end up ripping. Pay the price and get something that will last for years. This sheeting is great in the summer with a shade cloth, and fantastic in the winter. I am not happy that I am going to have to build another greenhouse to replace the one I just lost. I will be using nothing but the hard Solexx Panels this time around. Not much happens in the Northwest. Sure, we are in an earthquake and volcano zone, but the chances of a major event happening in your lifetime is rare. A few weeks ago, we had a very unusual emergency alert come through the Portland community. The alert said to not drink tap water until further notice due to a potential ecoli scare. Immediately, we realized we were not prepared with extra bottled water on hand and headed to the nearest store. When we arrived, the parking lot was full. Inside, people were lined up at the checkout line with carts full of nothing but water. The water isle was already empty in less than 30 minutes. Are you looking for a way to use your greenhouse to make money by starting a side greenhouse business? There are many ideas for starting a greenhouse business, but I just heard a great idea from an industry newsletter (Grower Talks) that I want to pass on to you. They were suggesting this idea to nurseries to make some extra money, but it would be easy for hobby greenhouse owners to put it into action as well. Greenhouse plastic can be a very versatile part of your greenhouse gardening hobby or business. By using greenhouse plastic sheeting, you can turn a sunny spot on your property into an inexpensive greenhouse with a minimal investment of time and money. Many wire-frame greenhouse kits come ready made for easy assembly with a lightweight, sturdy frame and easy to install greenhouse plastic. These types of greenhouse kits make greenhouse gardening easy and affordable for everyone. Choosing the best greenhouse design for your personality can help you gain more enjoyment from your greenhouse gardening hobby. Your greenhouse should reflect your likes and personality as much as your home does, and this often begins with selecting an appropriate structural design for your greenhouse. A glass greenhouse design reflects a preference for the traditional. 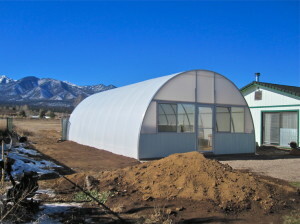 While not very practical, these types of greenhouses are often elegant, beautiful to observe, and pricey. They often have elaborate adornments, and can be green, gray, black, or even wooden in some cases. Wrought iron accessories compliment the traditional glass greenhouse well. These greenhouses reflect elegance, calm, and a connection with nature. While they look pretty, glass greenhouses are the least efficient requiring diligence to keep them from over heating in the summer, and they have a higher heat loss in the winter.